thisismyrobot: 7 gram robot can jump 1.4m every 3 seconds! 7 gram robot can jump 1.4m every 3 seconds! 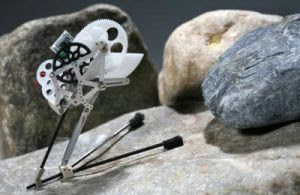 Researchers from the Laboratory of Intelligent Systems at EPFL have demonstrated a 7 gram micro-robot that has the ability to jump more that 27 times its own body size. Using a tiny pager motor, the robot builds up a store of elastic energy that is released to propel the robot into the air. The researches envisage extending the technology with additional power coming from solar panels and a suite of micro-sensors for remote monitoring in hard to reach locations.